My name is Amit Bedi and I am from India. I have been staying in New Zealand for over two years now. I completed my primary as well as secondary education in India. 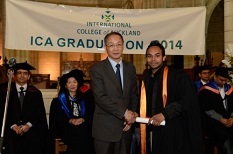 I completed the National Diploma in Business (Level 5) and NZIM Diploma in Management (Level 6) from ICA. Furthermore, I am also working with Cambium Group Ltd as a Field Operational Manager. I have had the best educational experience at ICA. In my two years at ICA, I did not face any problem. Professional tutors and the management staff are always ready to help you whenever required. We also indulged in tons of social and educational activities that made studying at ICA very memorable. I will forever feel nostalgic about ICA.